All training courses can be customized to accommodate the customer’s specific need. They range from beginner to advanced levels and are offered in multiple languages. Our support does not end there; 3Chem also offers on-site technical support at the customer’s request. 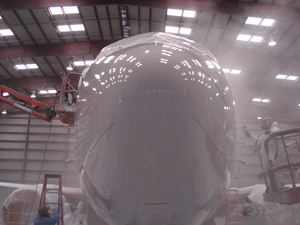 We understand application is an intricate part of the aircraft coating process. Our technical support team has over 50 years of combined experience in the aerospace coating industry and is always ready to land a hand. From the beginning of your paint job to the end; 3Chem is ready and willing to assist you. Please fill out the form below to request on-site product training or technical support. We will contact you within 48 hours to discuss your specific requirements. “We recommend 3Chem to all our customers for its quality, uniformity, and high gloss. For us, it is easy to use. Great product”.